The Unites States spends 17% of GDP on healthcare, or over $8,400 per capita, more than any other nation. 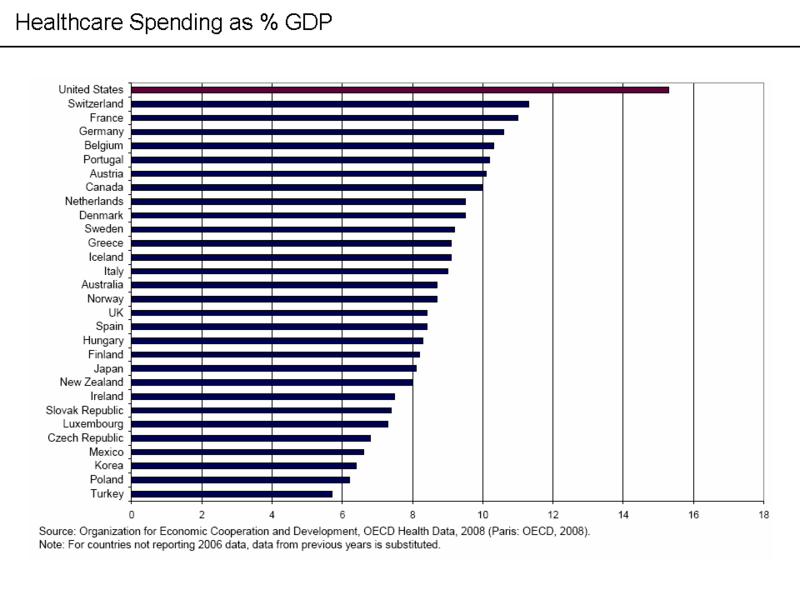 No other developed country spends more than 12% of GDP on medical care. And yet our people have some of the poorest healthcare outcomes in the developed world. Some 46 million Americans are uninsured. We rank 30th in infant mortality. Our life expectancy is 50th in the world, behind all developed nations. Medical expensed is a major factor in 62% of personal bankruptcies. Spending so much to get so little. Truly we are not getting the maximum value for our health care expenditures. We need to have universal access to healthcare. This does not need to be accomplished through a government bureaucracy, but it does need to be done. Universal healthcare will provide for early diagnosis and intervention, saving billions of dollars in the long run. As it is now, people without access to health care normally wait until their condition requires emergency room treatment at high cost. They are forced to wait until their minor medical issues become crises before their conditions can be treated. Under the current health care system medical care is delayed for those who can least afford it. Imagine a small child with an earache. The parent is forced to delay medicalcare due to the high cost of treatment, let’s say $200 for a doctor visit, lab tests, and prescriptions. Without access to healthcare the child’s condition worsens until the child is taken to the emergency room with a high fever and unbearable pain. Because of the delay a relatively minor malady that could be treated for a few hundred dollars may now cost thousands or even tens of thousands of dollars. And on top of this, the child may have become deaf or suffered other permanent impairment requiring a lifetime of special care. Single payer health care will end the costly paperwork and delays caused by our current multiple-payer system. Health care professionals would be able to concentrate on providing health care as opposed to figuring out who is going to pay and how to prepare and submit the paperwork for reimbursement. Pre-existing conditions will no longer be an issue as all will have insurance regardless of their condition. Everyone can be covered if everyone pays. Universal healthcare will focus on prevention and early intervention. Vaccines, blood pressure monitoring, diabetes testing, cancer screening, health education, weight control, nutrition and exercise, stop smoking campaigns, and perinatal care will become essential programs for maintaining health and wellness, and for reducing healthcare costs in the long run. Under universal healthcare the focus will shift from disease care to wellness care. We need a fundamental shift in priorities for healthcare. Under our current system, approximately 75% of a person’s health care expense comes in the final year of life. Instead of paying for heroic measures to extend life of the critically ill, we need to shift our resources and our focus towards maintaining health and wellness for all. In the most extreme cases, our heroic measures do not extend life, but only prolong death at a horrific cost. Those are healthcare dollars that could better be invested elsewhere. Healthcare rationing will be required under any conceivable healthcare system. The old indemnity insurance system failed because plan members could demand essentially unlimited medical coverage. If the first doctor refused to do a requested procedure, the patient could seek out ten additional doctors, and undergo ten more sets of tests. Eventually, a doctor would agree to do the procedure, even if it had limited or no justifiable medical value. And the result was that the insurance company was expected to pay the full cost of the search for treatment as well as the actual treatment. It is not financially possible to perform all of the medical procedures that we know how to do. Nor is that always the wisest course of action. The cost of heroic medical care is paid not only in scarce healthcare dollars, but in pain, incapacity and suffering of the patient as well. The cost of intensive care is approximately $3,000 per day. If the patient in such circumstances has a chance of recovery, then the expense as well as the pain and suffering may well be worth it. But if the patient has no chance of recovery, then what is gained by the expense, pain and suffering? And in gauging the capacity for recovery we must use sober reasoning and not wishful thinking. But we must also look at the negative quality of life for the patient. If a patient has no chance of recovery, how long should they be maintained by such heroic means? And furthermore, what is the quality of life for that patient? This situation demonstrates the difference between extending life and merely delaying clinical death. The irony is that under such extreme circumstances we treat our pets more humanely than we treat our parents. Before making any major medical decisions we must also consider other factors such as the patient’s age, health, his or her capacity to endure the procedure, and the potential for improvement in quality of life that the procedure offers. For example, an eighty-six year old with congestive heart failure ought not to be considered for a liver transplant.